Poullain live with The Darkness. A bassist or bass player, is a musician who plays a bass instrument such as a double bass, bass guitar, keyboard bass or a low brass instrument such as a tuba or sousaphone. Different musical genres tend to be associated with one or more of these instruments. Since the 1960s, the electric bass has been the standard bass instrument for funk, R&B, soul music, rock and roll, reggae, jazz fusion, heavy metal, country and pop music. The double bass is the standard bass instrument for classical music, bluegrass, rockabilly, and most genres of jazz. Low brass instruments such as the tuba or sousaphone are the standard bass instrument in Dixieland and New Orleans-style jazz bands. The Darkness are a British rock band formed in 2000. The band consists of Justin Hawkins, his brother Dan Hawkins, Frankie Poullain and Rufus Tiger Taylor (drums). Milnathort is a small town in the parish of Orwell in Kinross-shire, Scotland. The smaller neighbour of nearby Kinross, Milnathort has a population of roughly 2,000 people. It is situated amidst picturesque countryside at the foot of the Ochil Hills, and near the north shore of Loch Leven. From 1977 it became more easily accessible due to the development of the M90 motorway. The name comes from the Gaelic maol coirthe meaning "bare hill of the standing stones". Poullain was the only original Darkness member not from the Lowestoft area. Lowestoft is an English town and civil parish in the county of Suffolk. The town, on the North Sea coast, is the most easterly settlement of the United Kingdom. It is 110 miles (177 km) north-east of London, 38 miles (61 km) north-east of Ipswich and 22 miles (35 km) south-east of Norwich. It lies on the edge of The Broads system and is the major settlement in the district of Waveney, with a population of 71,010 in 2011. Some of the earliest evidence of settlement in Britain has been found here. As a port town it developed out of the fishing industry and as a traditional seaside resort. It has wide, sandy beaches, two piers and other attractions. While its fisheries have declined, oil and gas exploitation in the southern North Sea in the 1960s added to its development, as a base for the industry alongside nearby Great Yarmouth. This role has declined, but the town has begun to develop as an Eastern England centre of the renewable energy industry. Poullain left the band on 23 May 2005, citing "musical differences" as the reason. He was replaced by Richie Edwards, a former guitar technician for the band. His departure caused quite a stir with the press, most notably in the NME magazine where he was reportedly regarded as their favourite member of the band. Richie Edwards is an English musician. He is the former bassist of the British hard rock band The Darkness and the guitarist/vocalist of their successor band Stone Gods. He was confirmed as a member on 13 June 2005 replacing Frankie Poullain on bass. 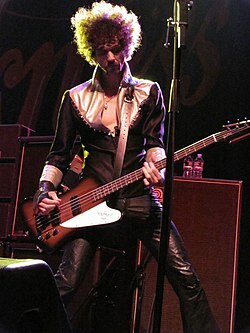 When The Darkness disbanded following Justin Hawkins' departure, Edwards switched to lead vocals with Toby McFarlaine taking over on bass. With original Darkness members Ed Graham and Dan Hawkins completing the new line-up, they recorded under the new name of The Stone Gods. A guitar technician is a member of a music ensemble's road crew who maintains and sets up the musical equipment for one or more guitarists. Depending on the type and size of band, the guitar tech may be responsible for stringing, tuning, and adjusting electric guitars and acoustic guitars, and maintaining and setting up guitar amplifiers and other related electronic equipment such as effect pedals. However, in 2011 The Darkness officially announced that they were to reunite, with all 4 original members. Frankie described this as being "Just like old times". The band sub-headlined Download Festival at Donington Park, England in June 2011, playing under Def Leppard. They also played at Hammersmith, with Queen guitarist Brian May joining the band. The band's third studio album Hot Cakes was released in early 2012, as the band embarked on the Hot Cakes tour. 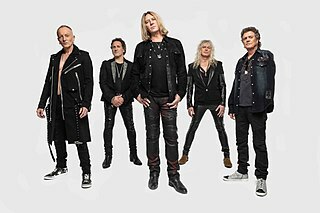 Def Leppard are an English rock band formed in 1977 in Sheffield as part of the new wave of British heavy metal movement. Since 1992, the band has consisted of Joe Elliott, Rick Savage, Rick Allen, Phil Collen, and Vivian Campbell. This is the band's longest lasting line-up. The Gibson Thunderbird is an electric bass guitar made by Gibson and Epiphone. 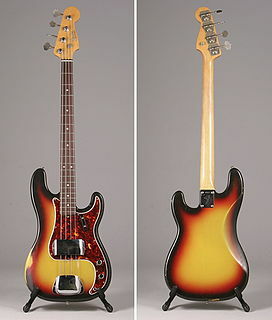 The Precision Bass is a bass guitar manufactured by Fender Musical Instruments Corporation. In its standard, post-1957 configuration, the Precision Bass is a solid body, four-stringed instrument equipped with a single split-coil humbucking pickup and a one-piece, 20 fret maple neck with rosewood, pau ferro, or maple fingerboard. 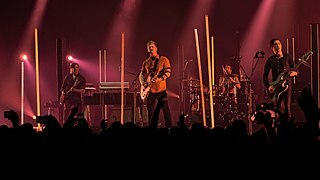 Queens of the Stone Age is an American rock band formed in 1996 in Palm Desert, California. The band's line-up includes founder Josh Homme, Troy Van Leeuwen, Michael Shuman, Dean Fertita, and Jon Theodore. Nicholas Beggs is an English musician, noted for playing the bass guitar and the chapman stick; he is a member of The Mute Gods and Kajagoogoo, formerly also a part of Iona and Ellis, Beggs, & Howard and plays in the band of Steven Wilson. Justin David Hawkins is an English musician, singer and songwriter, best known for being the lead singer and lead guitarist of The Darkness. Heavily influenced by classic bands of the 1970s and 1980s, Hawkins is noted for his falsetto singing voice and on-stage persona. He was also the lead singer and guitarist for the band Hot Leg, formed in 2008, and now on hiatus. Since 2005 he has been active in his synthpop alter ego British Whale. Edwin James Graham is an English musician who is best known as the original drummer of the rock band The Darkness, as well as the subsequent successor band Stone Gods fronted by guitarist and singer Richie Edwards. Jack Steven Irons is an American drummer and multi-instrumentalist. He is best known as the founding drummer of the American rock band Red Hot Chili Peppers, and as a former member of Pearl Jam, with whom he recorded two studio albums. The Trammps were an American disco and soul band, who were based in Philadelphia and were one of the first disco bands. Daniel Francis Hawkins is an English rock guitarist, best known as a guitarist and backing singer of the UK band, The Darkness. The band fronted by his older brother Justin Hawkins, achieved notable mainstream success between 2002 and 2006. He also plays lead guitar for Stone Gods. He is influenced by hard rock and glam metal genre such as Led Zeppelin, Aerosmith, Def Leppard, Whitesnake, AC/DC, Queen, Mötley Crüe and Thin Lizzy. 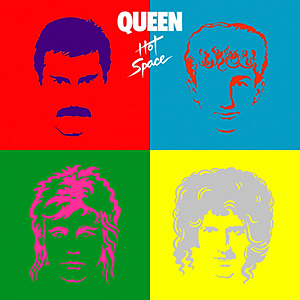 Hot Space is the tenth studio album by the British rock band Queen. It was released on 21 May 1982 by EMI Records in the UK and by Elektra Records in the US. Marking a notable shift in direction from their earlier work, they employed many elements of disco, funk, rhythm and blues, dance and pop music on the album. This made the album less popular with fans who preferred the traditional rock style they had come to associate with the band. 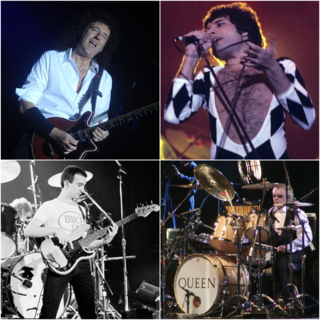 Queen's decision to record a dance-oriented album germinated with the massive success in the US of their 1980 hit "Another One Bites the Dust". 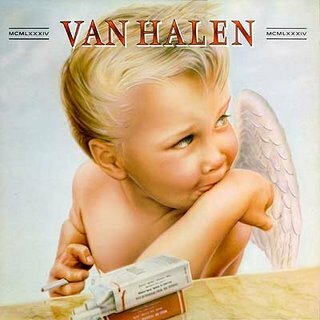 1984 is the sixth studio album by American hard rock band Van Halen, released on January 9, 1984. It was the last Van Halen album until A Different Kind of Truth (2012) to feature lead singer David Lee Roth, who left in 1985 following creative differences, and the final full-length album with all four original members. 1984 and Van Halen's debut are Van Halen's bestselling albums, each having sold more than 10 million copies. George Andrew McCluskey is an English singer, songwriter, musician and record producer. He is best known as co-founder, singer and bass guitarist of the electronic band Orchestral Manoeuvres in the Dark (OMD). One Way Ticket to Hell ...and Back is the second studio album by the British rock band The Darkness. It was released on 28 November 2005 through Atlantic Records, reaching number 11 on the UK Album Chart and eventually attaining platinum status in the UK. Three singles were released from the album. The lead single, "One Way Ticket", reached number 8 on the UK Singles Chart, as did the second single "Is It Just Me?" Stone Gods were a British hard rock / heavy metal band formed by some ex-members of the UK hard rock band The Darkness. Their debut album, titled Silver Spoons & Broken Bones, was released on 7 July 2008, with the first single "Knight of the Living Dead" being released on 23 June 2008. On 9 December 2010 they officially went on hiatus. Hot Leg were an English rock band led by The Darkness frontman Justin Hawkins. The band consisted of Hawkins, Pete Rinaldi, Samuel SJ Stokes and Darby Todd. Their debut album Red Light Fever was recorded in London in early 2008, and was released on 9 February 2009 by Barbecue Rock Records. I Believe in a Thing Called Love is the debut extended play (EP) by English rock band The Darkness. Released on 12 August 2002 by Must Destroy, the EP features three tracks which would later appear on the band's debut full-length album Permission to Land in 2003, including UK top-ten singles "I Believe in a Thing Called Love" and "Love Is Only a Feeling". Hot Cakes is the third studio album by British rock band The Darkness, released on 20 August 2012 on Canary Dwarf Records. Produced by Nick Brine and band members Justin and Dan Hawkins, the album is the band's first since their 2011 reunion, and the first to feature founding bassist Frankie Poullain since the release of Permission to Land in 2003. It is also the last album to feature all 4 original members, after Ed Graham's departure in 2014. Despite not being released until 20 August, the album was made available to stream on the Rolling Stone website on 14 August. DNCE is an American pop band. The group consists of vocalist Joe Jonas, drummer Jack Lawless, bassist and keyboardist Cole Whittle, and guitarist JinJoo Lee. The group signed with Republic Records, who released their debut single, "Cake by the Ocean", in September 2015. The song reached the top 10 in several charts, including on the US Billboard Hot 100, where it peaked at No. 9. Their debut extended play, Swaay, was released the same year. They also were nominated for Favorite New Artist for the 2016 Kids' Choice Awards and Best Song to Lip Sync and Best Anthem for the 2016 Radio Disney Music Awards. The group performed at the 2017 Fashion Meets Music Festival. Pinewood Smile is the fifth studio album released by British hard rock band The Darkness. Produced by Adrian Bushby, the album was released on 6 October 2017 and is the first album by the band to be released by Cooking Vinyl. It is also their full first album to feature Rufus Tiger Taylor on drums, after Emily Dolan Davies left the band in 2015. 1 2 "Frankie's dark secret; ROCKER'S GUILTY PAST Brits winner, 32, revealed as a Frannie, 37. - Free Online Library". Thefreelibrary.com. Retrieved 2015-11-23. ↑ "Poullain Quits The Darkness". Contactmusic.com. 23 May 2005. Retrieved 11 February 2011. ↑ "The Darkness replace Poullain". Contactmusic.com. 15 June 2005. Retrieved 11 February 2011. ↑ John-Paul Pryor. "Frankie Poullain's Dancing in the Darkness". dazeddigital.com. Retrieved 16 March 2011. "Get Your Hands Off My Woman"
"I Believe in a Thing Called Love"
"Christmas Time (Don't Let the Bells End)"
"Love Is Only a Feeling"
"Everybody Have a Good Time"
This article about a Scottish musician is a stub. You can help Wikipedia by expanding it. This article about a British bass guitarist is a stub. You can help Wikipedia by expanding it.